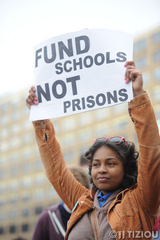 This playlist is are designed to shed light on the realities of the School To Prison Pipeline. The School To Prison Pipeline is a collection of conditions and policies that push students out of school and into the criminal justice system. Some of these policies include chronic underfunding of public schools, and school discipline policies that criminalize students. This series also highlights some of the ways that young people are organizing to end these harmful policies, and create alternatives that prepare students for college and careers. In Philly, high school students from the Philadelphia Student Union are organizing their schools and communities to stop the School To Prison Pipeline. These are a few of their stories. On Valentine's Day, more than 400 students and parents from across Pennsylvania held a rally for public education at the State Capitol. This action came a week after Gov. Corbett announced his plan for the next state budget -- a proposal that would carry over last year's $1 billion cuts to education funding. Students demanded that Gov. Corbett restores the cuts and makes equitable school funding be a top priority in the next state budget. The action was organized by Philadelphia Student Union, Project Peace, Chester student leaders, and A+ Schools' TeenBloc. It was co-sponsored by Juntos and the Campaign for Nonviolent Schools. How can we make schools safer without criminalizing youth? How can we confront bias violence? What kinds of restorative practices should we implement in place of harsh discipline policies? What role should students play in finding solutions? These are some of the questions that were discussed and answered during the Campaign for Nonviolent Schools'MLK Day event. The Campaign for Nonviolent Schools hosted an expert panel of youth and adults, to offer solutions for ending structural, interpersonal, and bias violence in our schools and communities. Panelists included: Steve Korr, International Institute for Restorative Practices; Helen Gym, Asian Americans United; Bummi Samuels, Philadelphia Freedom Schools; Josh Glenn, Youth Art and Self Empowerment Project and Campaign for Nonviolent Schools; Neil Geyette, Philadelphia High School Teacher; Azeem Hill, Philadelphia Student Union and Campaign for Nonviolent Schools. Here are some highlights from the event. This piece was edited by Andrea Jobe, and narrated by Shayla Johnson. But students from several organizations are fighting to end the school to prison pipeline, as members of theCampaign for Nonviolent Schools. Many of these students shared their experiences at an event calledYouth Speak-Out Against Push Out. It was a part of theDignity in Schools National Week of Action on School Pushout. This radio piece features students' voices from this powerful event. It was produced by Shayla Johnson and Andrea Jobe. It has been said that you can predict the prison population by looking at how many third graders perform poorly on standardized tests. The school to prison pipeline starts early. It has been said that you can predict the prison population by looking at how many third graders perform poorly on standardized tests. But has anyone ever asked third graders what they think about this? Kim Reed did. This is her report.